This technical note will provide general instructions of how to use Lexbe eDiscovery Platform in conjunction with JAWS software. 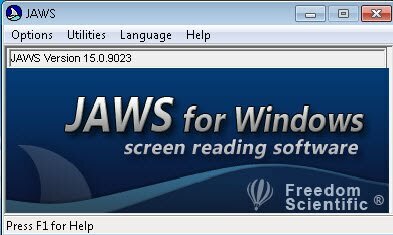 JAWS is the world's most popular screen reader, developed for computer users whose vision loss prevents them from seeing screen content. JAWS reads aloud what's on the PC screen and gives the user a unique set of intelligent tools for navigating and accesses Web pages and all screen content. This software provides many useful commands that make it easier to use programs, edit and read documents. JAWS enables you to work with Lotus Symphony (IBM), and also is compatible with Microsoft Office Suite, MSN Messenger, Corel WordPerfect, Adobe Acrobat Reader, Internet Explorer, Firefox - and many more applications that are used on a regular basis on the job. Download the latest version of JAWS that is appropriate for your computer's operating system. For a list of new features available in this version of JAWS, see What's New in JAWS 15. For a list of system requirements, see JAWS System Requirements. Always check for updates after installing JAWS, MAGic, OpenBook, or WYNN trial software to make sure that you have the latest product release. You can also use this opportunity to download free training books, saved in the DAISY digital document format, to use with your trial software. 1-Open the application's main window. 3-Select Check for Updates. The update feature determines if you have the most current release. If you do not, select one or more items from the list and then select INSTALL to begin the update. >Make sure that NumLock is off. >You will probably want to test JAWS in Internet Explorer, even if it is not your primary browser. >Remember that screen reader users typically do not use a mouse. As you become more comfortable with JAWS, try using only the keyboard. >Keep in mind that most IE shortcut keys will work when using JAWS. >The page may not scroll while you read, so you may hear content being read by JAWS that isn't visible on the screen. F5 / Shift + F5 - Page refresh / Hard page refresh. If you get lost, this is how you can start over. We also offer Project Management and Technical Services if engaged to support your efforts by helping to execute specific requests for document identification. Please contact your sales rep or our Support Center if needed.